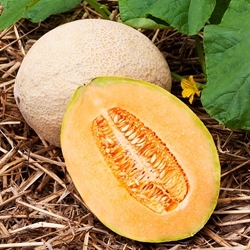 Melons are a warm season tender plant that need fertile soil full of organic matter and full sun. Plant after danger of frost has past. Plants available in a four pack. All plants are certified organic. Select here for transplant information, pick up and order dates. Top quality canteloupe that stands up to the hybrids. Resistant to powdery mildew which is a problem with most melons. The flesh is dark orange, juicy and very aromatic. Fruits average 2-3 pounds.